Please note: This is only an upgrade for people who have already registered as a "Classic" participant only. If you have not registered, please return to the main site and register there. Processing time may take up to 3-5 business days to complete. Thank you for your patience! If you have any questions on the status of your platinum upgrade, please contact us. Okay, first of all, THANK YOU for registering for Extra Life 2019. We're really happy you're joining us! Platinum registration is totally optional. If winning prizes and snagging a shirt are important to you, then we'd love to help you upgrade. 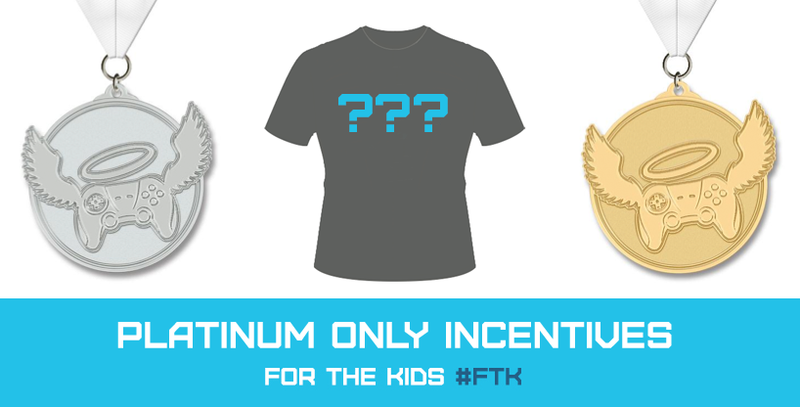 It only costs $19, but it gives you the opportunity to unlock this year's official sticker, t-shirt, collectible Hero Medals and win exclusive prizes only available to platinum registrants. To upgrade to platinum simply click here or click "donate to the event" above. If unlocking some exclusive Extra Life swag isn't a big deal to you, then you're probably just fine as a "classic" registrant. Whether you're signed up as a Platinum or Classic registrant, you're a hero. We love ya for registering to play games and heal kids. Thank you so much!